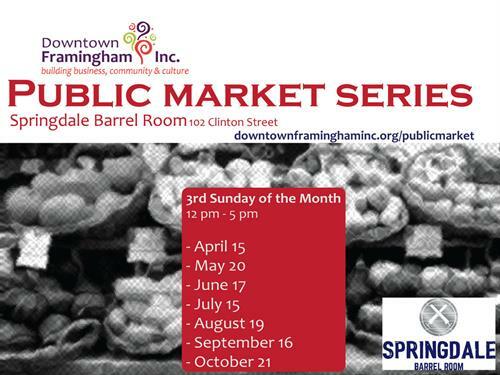 Registration is now open for our Public Market Series at the Springdale Barrel Room. Set-up for each market starts at 11:00 am inside the Springdale Barrel Room via the freight elevator (Clark Street side). Vendors offering produce take precedence. Each market will feature no more than 8 select vendors! Upon confirmation, registration is $20.00 for vendors who bring their own tables and chairs and $30.00 for vendors who order tables and chairs. Thank you for supporting Downtown Framingham, Inc.! Accepted vendors will be assisted with submission of all health and vendor permits. The 3rd Sunday of each month (April-October) from 12-5 p.m.